NOTE:For safety reasons it is recommended that you do NOT daisy chain power extension leads. 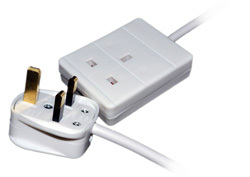 You should also be aware that the maximum is 13 Amps and this is split across all four sockets. Be careful not to overload the extension. e.g. A 2KW Heater on a 240V Power Supply, draws a current of 8.33 Amps. Two of these is equal to 16.67 amps, which is greater than 13 amps and would blow the fuse on this extension. 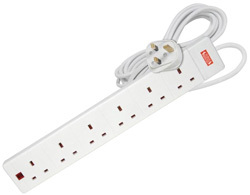 NOTE: For safety reasons it is recommended that you do NOT daisy chain power extension leads. 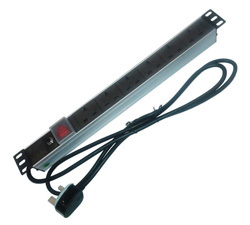 You should also be aware that the maximum is 13 Amps and this is split across all six sockets. Be careful not to overload the extension. e.g. A 2KW Heater on a 240V Power Supply, draws a current of 8.33 Amps. Two of these is equal to 16.67 amps, which is greater than 13 amps and would blow the fuse on this extension. 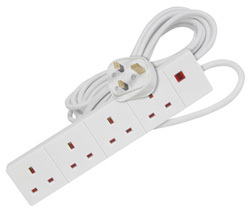 Single UK plug extension socket. Copyright © Cabling4Less Limited. All Rights Reserved 2018.